According to a recent report by Tuttosport, Inter Milan has entered the chase to secure the services of Christian Eriksen from Tottenham Hotspur. The same source has revealed that Inter’s director of football Piero Ausilio has held talks with Spurs over a potential transfer to bring the Danish international to the San Siro next summer. The 27-year-old is yet to commit his long-term future to the North London club with his current deal set to expire in the summer of 2020. Eriksen has enjoyed another solid campaign with Spurs this term after putting in a few match-winning displays under Mauricio Pochettino’s stewardship during this season. The former AFC Ajax starlet has featured in 42 matches for Spurs this term, scoring eight goals while creating 16 assists in all competitions. One could argue that he would be an upgrade over any of Inter’s current midfield options at the San Siro. It is quite likely that Spurs might have to consider parting ways with Eriksen as he will have just one year remaining on his deal at the end of this campaign. Hence, Pochettino needs to cash in on him in this off-season or else risk losing him for free in the summer of 2020 when he becomes a free agent. Should Spurs Let Him Leave? 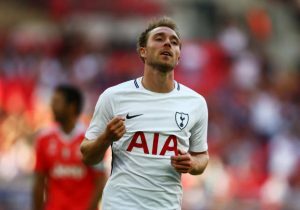 Sending Eriksen to Italy would be better than losing him to one of Tottenham’s rivals so Pochettino should consider letting him go to the Serie A outfit if he receives the right offer for the player this summer. The Dane has been a joy to watch ever since Pochettino took charge of the club back in 2014. He has been a consistent performer for Spurs over the past few years which makes his time in the English top-flight a grand success. However, the Dane has not won any trophies with Tottenham, so it will be a surprise if he decides to leave without delivering any silverware at White Hart Lane. Pochettino should consider selling Eriksen if he doesn’t commit his long-term future to the North London club. It would be better to generate some cash from his transfer rather than keeping hold of him for another year. Spurs could use the money acquired from his sale to bring in a suitable replacement ahead of the new season. Tottenham Hotspur Midfielder’s Talks Over A New Contract Have Stalled: What Is Pochettino’s Play? Tottenham Hotspur Stalwart Now Wanted By Barcelona: Does It Make Any Sense?